If you buy 5 recordings you get 2 more for free. If you have bought something from us previously, please log in so we can add all your new presentations to your account. Mary is a 22-year-old woman presenting for treatment due to concern her family has regarding her relationship with eating and exercise. She lives at home and works full time. 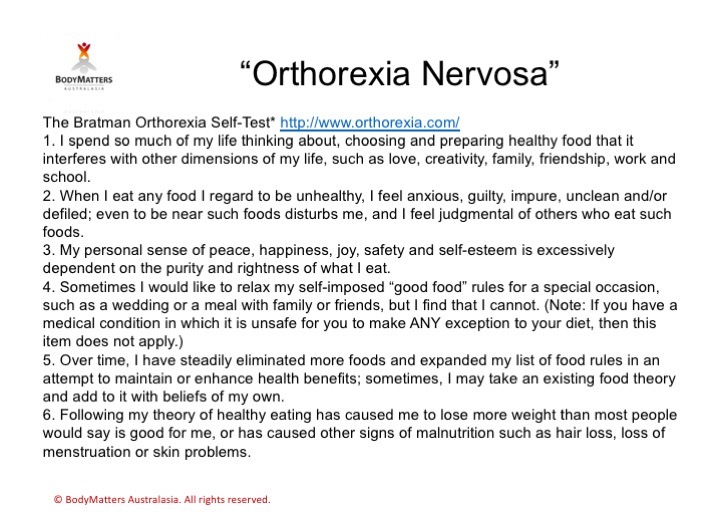 She meets diagnostic criteria for OSFED (Other Specified Eating and Feeding Disorder) and her presentation is consistent with “orthorexia nervosa” (a laypersons diagnosis). 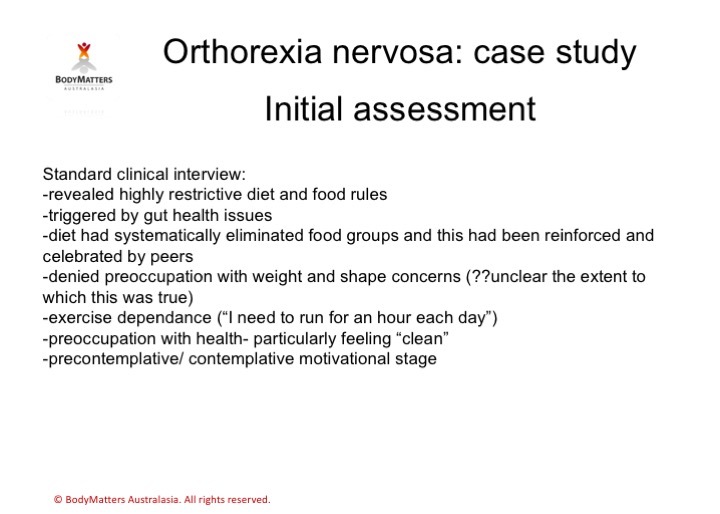 This case study discusses what orthorexia nervosa is and identifies a treatment framework that is multidisciplinary and includes dietetic, psychological and medical support. The importance of dietitians being familiar with eating disorders such as orthorexia is also highlighted. Sarah McMahon is Director of BodyMatters Australasia, and a psychologist who has been working in the field of eating disorders for over a decade. Sarah embraces industry leading best practice and advocates for "health at every size" to help people establish a healthy and balanced relationship with their bodies through diet and exercise. Sarah has a Masters of Public Health and a passion for educating the community about disordered eating. In May 2017, Sarah was interviewed on Radio National All In The Mind about orthorexia nervosa. Listen here for a recording of this insightful piece. Low carb diets for diabetes?